JSON Web Tokens, or JWT as we tend to call them, is an open standard that stores claims in an encoded JSON object. Basically: JSON Web Tokens allow you to safely store session data client-side. It clearly states that this token is a JWT that uses HS256. In other words: SHA256 hashing. The payload can contain any claim you want, but keep in mind that the more data you store, the larger your token is going to become. That’s why some of the reserved claims only use 3 characters. The example above has the sub claim. It’s a reserved claim that stores the subject of the payload. RFC 7519 section 4.1 has a complete overview of registered claims and their meaning. More information can be found on the JWT.io website. The JWT signature is secure because of HMAC, but there’s also a security assumption that traffic is encrypted through TLS. Without an encrypted connection via TLS, the sensitive payload is readable to anyone who is sniffing your traffic. Either way, you want the JWT to be sticky, meaning it should automatically be sent on every request. Where does Varnish come into play? Varnish is great for caching, but caching stateful data is tricky. Traditionally session data is stored on the server and is managed by the backend application. This means that caching goes out of the window. 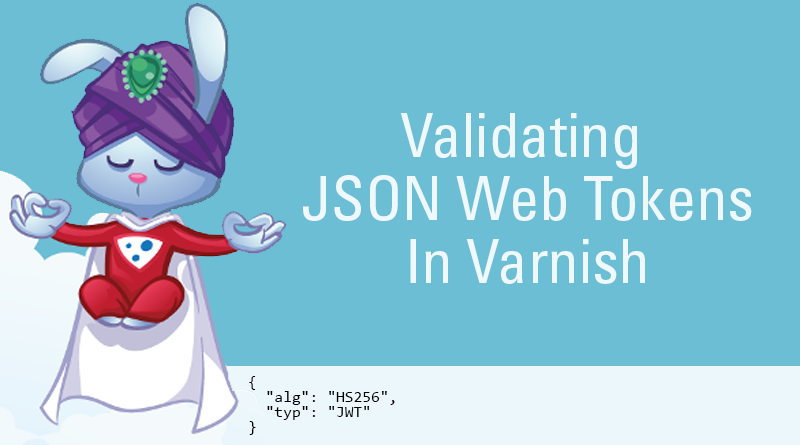 But what if I told you, you could validate JSON Web Tokens in Varnish? This could potentially eliminate costly backend calls and cache pages that were otherwise not cacheable. You can even make decision based on specific JWT values in Varnish. The base64 and HMAC support aren’t natively part of Varnish. You will need to install vmod_digest. Once that’s done, you can import the VMOD in your VCL code and benefit from its power. The following snippet of code creates a custom VCL procedure that can be called in your regular VCL. The JSON Web Token is stored in a cookie. The cookie is called “token”. Although we’re removing the custom request headers at the end of the procedure, it still makes sense to keep some of them. The example above contains X-Login and X-Username. We can use these values in vcl_recv to make some caching decisions. The idea is that we have a private page, hosted on the “/private” URL. Users who don’t have the login flag in their token, will not be granted access to this page, and will immediately be redirected to the login page. The login flag is stored in a custom X-Login header. Without JWT support in Varnish, you would otherwise not be able to cache this page and you would request this information from the backend. Keep in mind that this piece of VCL ignores all other cookies and caches all GET and HEAD requests. If your application depends on other cookies, the caching will be a bit too aggressive. You can either return Cache-Control: no-cache, no-store headers in your application, or you can add extra VCL code to deal with it. What should your backend do? Your backend will still be responsible for the token generation. There are plenty of good libraries out there for different programming languages. If you want to use JSON Web Tokens in your APIs, you can let your backend set a bearer token. For regular browser-based traffic, setting a cookie will do the job for you. A less obvious header to set is the Vary header. This header creates cache variations. This is important, because in our example the output of the “/private” page depends on the X-Login request header that contains our JWT login flag. Varnish will interpret this Vary header and create 2 cached versions depending on the value of the request header. Because we set X-Login in Varnish, it will be available for cache variations. To avoid too many cache variations, you should only return this Vary header for pages that need the variation. In our example there’s the “/private” page. But if your header, navigation, or other parts of your website refer to the login information, they should also contain a Vary response header. I created a demo application that features cacheable code. It’s a showcase for the proper use of HTTP headers. In version 2 I also added JSON Web Tokens for authorization and session storage. I use client-side session data to prove that you can stil cache pages that require session data or that require a login. The demo application is available on GitHub, the master branch does not include JWT, but the version 2 branch does. I was Googling for more information on JWT and Varnish. There was only one useful resource I could find: a slide deck by Andrew Betts. These slides were my main source of inspiration. Thanks Andrew! I wrote a book about Varnish in which I not only explain how Varnish works, but also how developers can improve the hit rate of their application by adopting HTTP best practices. 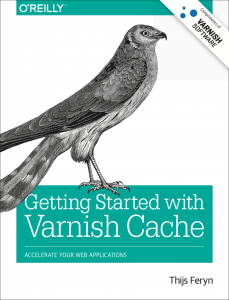 The book is called Getting Started with Varnish Cache and is published by O’Reilly.